The Treaty of Versailles radically altered the Geography of Europe. It had clauses that resulted in areas of land being taken from Germany. The maps on the next slide illustrate the scale of these losses. – From the maps on the next slide it is clear that Germany suffered large territorial losses. The provinces of Alsace and Lorraine returned to France; parts of Schleswig were given to Denmark; to the east, new countries were created to roughly match the ethnic balance of the area and finally, ‘The Polish Corridor’ was created which gave the Poles a broad strip of land that connected it to the sea – and consequently separated Eastern Prussia from the rest of Germany. In total, Germany lost over one millions square miles of land (28,000 of which had previously formed part of European Germany) and 6 million subjects. 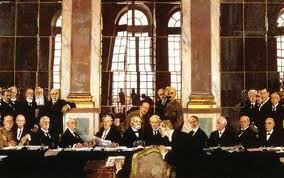 -The Treaty of Versailles blamed Germany for the First World War. As a result of this Germany was also held accountable for the cost of the war and the Treaty dictated that compensation would have to be paid to the Allies. 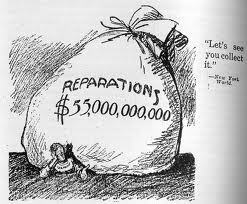 -These payments, called reparations, would be paid monthly and would total some £6,600 million (This figure was agreed by the Allies in 1921). Although Germany would also have to reconstruct her own economy at the same time as paying Reparations. -In addition, Germany had lost some of her most precious sources of Raw materials as her colonies, and some of the areas that were given to other countries, were rich sources of income. – These factors would make it harder for the German economy to cope. Further to this it is important to note the casualties suffered during the war. – Germany lost some 1.7 million men during the war, and a further 4.2 million are listed as being wounded. – The Political IThe Treaty triggered a number of political reactions. – Firstly the government of the day resigned, having refused to sign it. The incoming government had no choice but to sign the Treaty but was accused by some, General Ludendorff for example, of stabbing the Germany people in the back. This Theory grew in popularity as the economy suffered and many, former soldiers in particular, believed that the politicians had lost the war rather than the army. This, amongst other things, led to a growth in the number of people who distrusted the Weimar Republic and were unwilling to support it. This manifests itself in uprisings such as the Kapp Putsch and the Munich Putsch, though there are other factors which led to these uprisings. -The Treaty also called for the trial of the former Kaiser. This never happened as the Dutch government refused to hand him over, but this effectively stopped any chance of a restoration of the monarchy in Germany. – In Western Europe the Treaty signaled the beginning of a period of isolation for Germany. She became an outcast in international politics and was feared and distrusted by the Allies. This had a significant impact on the role that Germany would, and potentially could, play in European and World affairs in the early post war climate. However, whilst it is evident that Germany became politically isolated in the West, some historians would point out that their isolation has been exaggerated by Westerners. “Everywhere in the world was heard the sound of things breaking.” Advanced European societies could not support long wars or so many thought prior to World War I. They were right in a way. The societies could not support a long war unchanged. The First World War left no aspect of European civilization untouched as pre-war governments were transformed to fight total war. The war metamorphic Europe socially, politically, economically, and intellectually. European countries channeled all of their resources into total war which resulted in enormous social change. The result of working together for a common goal seemed to be unifying European societies. Death knocked down all barriers between people. All belligerents had enacted some form of a selective service which levelled classes in many ways. Wartime scarcities made luxury an impossibility and unfavorable. Reflecting this, clothing became uniform and utilitarian. Europeans would never again dress in fancy, elaborate costumes. Uniforms led the way in clothing change. The bright blue-and-red prewar French infantry uniforms had been changed after the first few months of the war, since they made whoever wore them into excellent targets for machine guns. Women’s skirts rose above the ankle permanently and women became more of a part of society than ever. They undertook a variety of jobs previously held by men. They were now a part of clerical, secretarial work, and te! aching. They were also more widely employed in industrial jobs. By 1918, 37.6 percent of the work force in the Krupp armaments firm in Germany was female. In England the proportion of women works rose strikingly in public transport (for example, from 18,000 to 117,000 bus conductors), banking (9,500 to 63,700), and commerce (505,000 to 934,000). Many restrictions on women disappeared during the war. It became acceptable for young, employed, single middle-class women to have their own apartments, to go out without chaperones, and to smoke in public. It was only a matter of time before women received the right to vote in many belligerent countries. Strong forces were shaping the power and legal status of labor unions, too. The right of workers to organize was relatively new, about half a century. Employers fought to keep union organizers out of their plants and armed force was often used against striking workers. The universal rallying of workers towards their flag at the beginning of the war led to wider acceptance of unions. It was more of a bureaucratic route than a parliamentary route that integrated organized labor into government, however. A long war was not possible without complete cooperation of the workers with respect to putting in longers hours and increasing productivity. Strike activity had reached its highest levels in history just before the war. There had been over 1,500 diffent work stoppages in France and 3,000 in Germany during 1910. 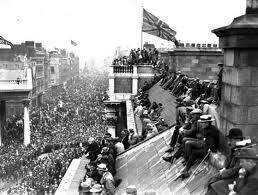 More than a million British workers stopped at one time or another in 1912. In Britain, France, and Germany, deals were struck between unions and government to eliminate strikes and less favorable work conditions in exchange for immediate integration into the government process. This integration was at the cost of having to act more as managers of labor than as the voice of the labor. Suddenly, the strikes stopped during the first year of the war. Soon the enthusiasm died down, though. The revival of strike activity in 1916 shows that the social peace was already wearing thin. Work stoppages and the number of people on strike in France quadrupled in 1916 compared to 1915. In Germany, in May 1916, 50,000 Berlin works held a three-day walkout to protest the arrest of the pacifist Karl Liebknecht. By the end of the war most had rejected the government offer of being integrated in the beaurocracy, but not without playing an important public role and gaining some advantages such as collective bargaining. The war may have had a leveling effect in many ways, but it also sharpened some social differences and conflicts. soldiers were no longer willing to sacrifice their lives when shirkers at home were earning all the money, tkaing, the women around in cars, cornering all the best jobs, and while so many profiteers were waxing rich. The draft was not completely fair since ot all men were sent to the trenches. Skilled workers were more important to industry and some could secure safe assignments at home. Unskilled young males and junior officers paid with their lives the most. The generation conflict was also widened by the war as Veterens’ disillusionment fed off of anger towards the older generation for sending them to the trenches. Governments took on many new powers in order to fight the total war. War governments fought opposition by increasing police power. Authoritatian regimes like tsarist Russia had always depended on the threat of force, but now even parliamentary governments felt the necessity to expand police powers and control public opinion. Britain gave police powers wide scope in August 1914 by the Defence of the Realm Act which authorized the public authorities to arrest and punish dissidents under martial law if necessary. Through later acts polices powers grew to include suspending newspapers and the ability to intervene in a citizen’s private life in the use of lights at home, food consumption, and bar hours. Police powers tended to grow as the war went on and public opposition increased as well. In France a sharp rise of strikes, mutinies, and talk of a negotiated peace raised doubts about whether France could really carry on the war in 1917. A group of French political leaders ! decided to carry out the war at the cost of less internal liberty. The government cracked down on anyone suspected of supporting a compromise peace. Many of the crackdowns and treason charges were just a result of war hysteria or calculated politcal opportunism. Expanded police powers also included control of public information and opinion. The censorship of newspapers and personal mail was already an established practice. Propaganda tries to force a doctrine on the whole people; the organization embraces within its scope only those who do not threaten on psychological grounds to become a brake on the further dissemination of the idea. World War I provided a place for the birth of propaganda which countries used with even more frightening results during World War II. Governments used the media to influence people to enlist and to brainwash them war into supporting the war. The French prime minister used his power to draft journalists or defer them in exchange for favorable coverage. The German right created a new mass party, the Fatherland Party. It was backed by secret funds from the army and was devoted to propaganda for war discipline. By 1918, the Fatherland Party was larger than the Social Democratic Party. Germany had become quite effective at influencing the masses. The economic impact of the war was very disproportioned. At one end there were those who profited from the war and at the other end were those who suffered under the effects of inflation. The opportunities to make enormous amounts of money in war manufacture were plentiful. War profiteers were a public scandal. Fictional new rich, like the manufacturer of shoddy boots in Jules Romains’s Verdun had numerous real-life counterparts. However, government rarely intervened in major firms, as happened when the German military took over the Daimler motor car works for padding costs on war-production contracts. Governments tended to favor large, centralized industries over smaller ones. The war was a stimulus towards grouping companies into larger firms. When resources became scarce, nonessential firms, which tended to be small, were simply closed down. Inflation was the greatest single economic factor as war budges rose to astronomical figures and massive demand forced shor! tages of many consumer goods. Virtually ever able-bodied person was employed to keep up with the demand. This combination of high demand, scarcity, and full employment sent prices soaring, even in the best managed countries. In Britain, a pound sterling brought in 1919 about one-third of what it had bought in 1914. French prices approximately doubled during the war and it only got worse during the 1920’s. Inflation rates were even higher in other belligerents The German currency ceased to have value in 1923. All of this had been forseen by John M. Keynes as a result of the Versailles Treaty. The danger confonting us, therefore, is the rapid depression of the standard of life of the European populations to a point which will mean actual starvation for some (a point already reached in Russian and approximately reach in Austria). Inflation affected different people quite differently. Skilled workers in strategic industries found that their wages kept pace with prices or even rose a little faster. Unskilled workers and workers in less important industries fell behind. Clerks, lesser civil servants, teachers, clergymen, and small shopkeepers earned less than many skilled labors. Those who suffered the most were those dependent on fixed incoming. The incomes of old people on pensions or middle class living on small dividends remained about the same while prices double or tripled. These dropped down into poverty. These “new poor” kept their pride by repairing old clothes, supplementing food budget with gardens, and giving up everything to appear as they had before the war. Inflation radically change the relative position of many in society. Conflicts arose over the differences in purchasing power. All wage earners had less real purchasing power at the end of the war than they had had at the beginning. To make matters worse some great fortunes were built during the wartime and postwar inflation. Those who were able to borrow large amounts of money could repay their debts in devalued currency from their war profit. Four years of chaos and utter destruction had smashed the old world Europe. The most “advanced” quarter of the world had turned to violence and barbarism of its own accord. Progress and reason had been suppressed for destruction. Moreover, it has brought to light an almost incredible phenomenon: the civilized nations know and understand one another so little that one can turn against the other with hate and loathing. Indeed, one of the great civilized nations is so universally unpopular that the attempt can actually be made to exclude it from the civilized community as “barbaric,” although it has long proved its fitness by the magnificent contributions to that community which it has made. The early part of the war satisfied the fascination with speed, violence, and the machine as manifested in the pre-war Futurists. Many movements shared a resolute “modernist” contempt for all academic styles in the arts, a hatred for bourgeois culture, and a commitment to the free expression of individuals. All these feelings were given an additional jolt of violence and anger by the horrors of the wartime experience. During the war there was a loss of illusions as described in All Quiet on the Western Front. Poets, like others, had gone to war in 1914 believing in heroism and nobility. Trench warfare hardened and embittered many. Freud said of disillusionment: When I speak of disillusionment, everyone will know at once what i mean. One need not be a sentimentalist; one may perceive the biological and psychological necessity for surrering in the economy of human life, and yet condemn war both in its means and ends and long for the cessation of all wars. British poet, Wilfred Own, who was killed in 1918 was transformed from a young romantic into a powerful denouncer of those who had sent young men off to war. In “Dulce et Decorum Est” he mocked “the old lie” that it was good to die for one’s country, after giving a searing description of a gassed soldier coughing out his lungs. The anger of the soldier-poets was directed against those who had sent them to the war, not their enemy. The war experience did not produce new art forms or styles. It acted largely to make the harshest themes and the grimmest or most mocking forms of expression of prewar intellectual life seem more appropriate, and to fost experiments in opposition to the dominant values of contemporary europe. The Dada movement, which mocked old values and ridiculed stuffy bourgeois culture, was one of these movements. A mood of desolation and emptiness prevailed at the end of a war where great sacrifice had brought little gain. It was not clear where post-war anger would be focused, but it would definately be in antibourgeois politics.